Indigenous eye health is improving, but more needs to be done. 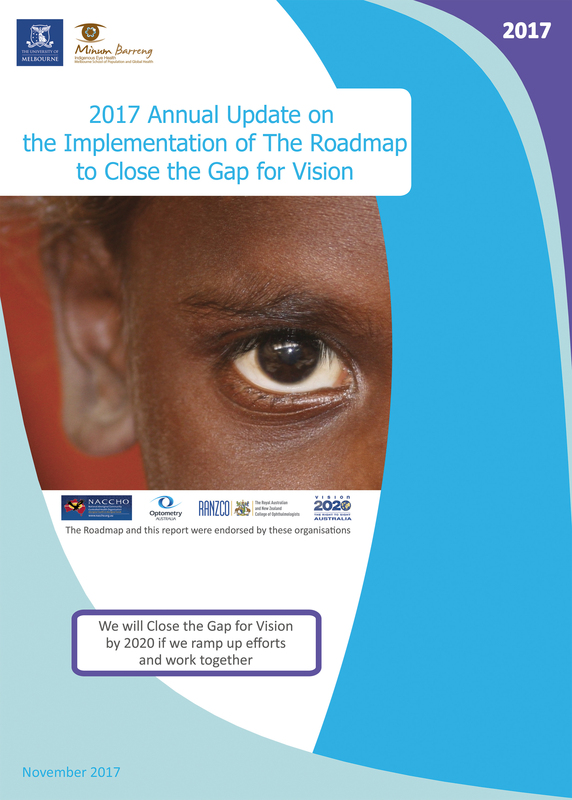 The 2017 Annual Update on the Implementation of The Roadmap to Close the Gap for Vision (the Roadmap) was launched at a special event during the RANZCO Annual Congress in Perth on Monday 30 October. This event marked the sixth update of the Roadmap and provided an opportunity to acknowledge the great work being undertaken by all the organisations operating in Indigenous eye health. The Hon. Fred Chaney AO formally launched the Annual Update, which highlights key achievements and progress made over the last 12 months on activities to close the gap for vision between Indigenous and non-Indigenous Australians. Melbourne Laureate Professor Hugh R Taylor AC, Indigenous Eye Health at the University of Melbourne, also spoke of the need to maintain progress to reach parity in eye health outcomes with the rest of the Australian population by 2020. The Roadmap was released in 2012 following extensive consultation with Aboriginal community and the broad range of key sector stakeholders. The Roadmap is a sector-endorsed, evidence-based policy framework that is being translated into practice to deliver equity in eye care between Indigenous and mainstream Australians. Implementation of the Roadmap is currently being undertaken in 37 regions across Australia, covering an estimated 60% of the Indigenous population. The 42 Roadmap recommendations promote sustainable improvement of access to eye health services, and include priorities for the long-term for governance, monitoring and evaluation, health promotion and financing for Indigenous eye health. A major focus is improved service coordination and systems improvement to facilitate the Indigenous patient journey from primary through to tertiary care, including cataract surgery and treatment for diabetic retinopathy. A number of significant milestones have been reached through the collective efforts of the many stakeholders working in Indigenous eye health. Sixty-seven per cent of 138 intermediate steps outlined in the Roadmap recommendations have now been completed and 16 out of 42 recommendations have been fully implemented. The Annual Update notes the findings of the National Eye Health Survey 2016, where blindness rates have been reduced from 6 times to 3 times as common for Indigenous adults as compared with non-Indigenous. The introduction of new Medicare item numbers for diabetic retinopathy screening in November last year shows an increasing uptake of the item for both Aboriginal and non-Aboriginal people. The Australian Institute of Health and Welfare also delivered the inaugural report on key indicators to monitor progress on Indigenous eye health outcomes in 2017. Another important achievement is the establishment of jurisdictional Indigenous eye health committees to provide oversight on regional and statewide eye health activities with 6 out of 8 jurisdictions working to improve eye health outcomes in their state or territory. Although several key initiatives have been implemented, there still remains important work to be done. Many policy recommendations require ongoing implementation. The Commonwealth government has provided longer term funding to the eye health sector for a range of activities including oversight, coordination, eye surgery support initiatives and the provision of retinal cameras for Aboriginal Medical Services. However, new funding is still urgently required to establish regional service coordination in all regions. The prevalence of Trachoma has reduced but may be plateauing and more work is urgently required to deliver safe bathrooms to facilitate face washing. “We are the only developed nation with endemic trachoma. It is only found in Indigenous communities. We need more timely reporting of data to allow more intense targeted intervention in the hot spots,” Professor Taylor says. RANZCO issued a position statement issued recently recommending cost certainty in billing practices for Indigenous patients. Ophthalmologists providing ophthalmology services supported by the Rural Health Outreach Fund (RHOF) are encouraged to charge the Medicare rebate for Indigenous consultations. The 2017 Annual Update on the Implementation of the Roadmap to Close the Gap for Vision demonstrates that real progress is being made to improve Indigenous eye health outcomes across Australia, and all stakeholders in the eye health sector have a role to play to close the gap for vision by 2020.